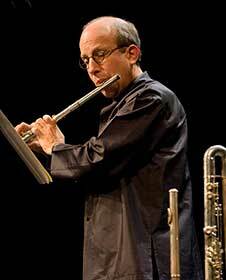 Since his arrival in Seattle in 1979, flutist Paul Taub has been a leading performer of chamber and contemporary music in the Northwest of the United States. Professor of Music at Cornish College of the Arts, he has had a strong musical presence in the Seattle music scene for years as a founding member and Executive Director of the Seattle Chamber Players. He has performed and recorded American and world premieres by internationally-known composers including Robert Aitken, Henry Brant, John Cage, George Crumb, Janice Giteck, Sofia Gubaidulina, Lou Harrison, Wayne Horvitz, Toshio Hosokawa, Shulamit Ran, Ned Rorem, Toru Takemitsu, Peteris Vasks, Reza Vali and many others. His work in contemporary music has been extensive in American, Soviet/Russian, and international repertoire, with recitals throughout the Southeast and Northwest of United States, New York, Western Canada, Southern France, and at the Leningrad Music Spring Festival in 1991. Paul has toured in Russia four times and has also performed in Greece, France, Estonia, Poland, Ukraine, Costa Rica and at universities and colleges all over the United States and Canada. Paul was a guest of the American Chamber Ensemble in New York in 1997, soloist at the International Harp Congress in Tacoma, Washington in a Takemitsu Memorial Concert in 1996, and featured performer for the New York Flute Club in 1994 and for National Flute Conventions in 1992, 1999, 2002 and 2009. His primary teachers have been Samuel Baron, Michel Debost, David Shostac, Marcel Moyse and Robert Aitken. His program of ten commissioned solo pieces celebrating his 20th year in Seattle was presented at Benaroya Hall in May, 1999. Oo-ee, the CD of this repertoire, is available on the Periplum label, and his second CD Edge contains music from the Eastern Europe. His November 2009 recital at Cornish College celebrated 30 years of making music in Seattle with a program of recent works that he has had a role in the creation of, by composers from four continents. Taub has served on the Board of Directions of Chamber Music America and is currently Assistant Secretary/Secretary-Elect of the National Flute Association.